Dad and I have always loved dogs, and grew up with them, and so we decided to get one. We were *only* going to wait until the new year, once we were back from holiday, but went to the pet shop anyway on Friday, Christmas Eve, just “to see”. 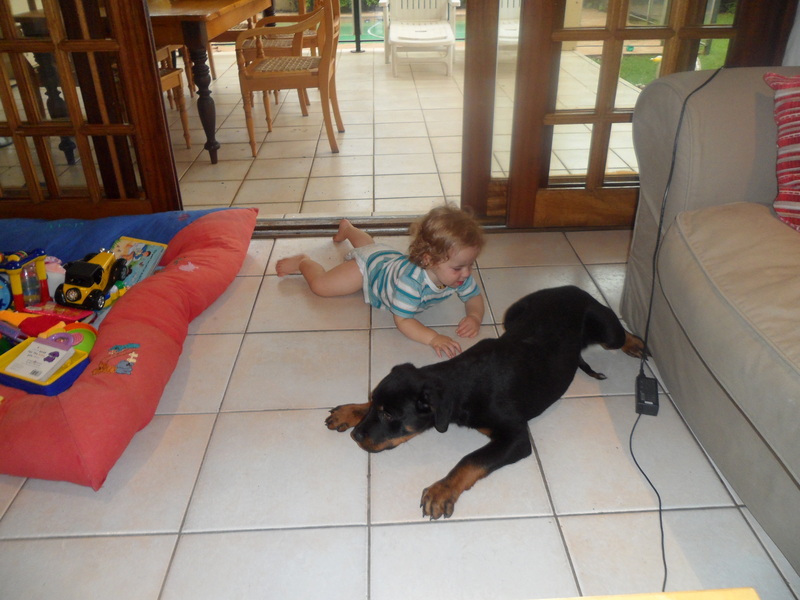 Well, we fell in love with a 14-week-old Rottweiler, who demonstrated, via the petshop owner, that he was great with kids (he did knock you over once or twice with his body weight, but he was just playing), he got on with cats (we’re yet to see that with our cats as they’re still a bit shellshocked that we’ve cheated on them with Another Domestic Animal), and he was obedient. It was the biggest impulse purchase of our lives, along with a 20kg bag of dogfood, leash, blanket, bowls, toys that look a lot like kiddie toys, biscuits that look a bit like your teething biscuits, and supplements. He wouldn’t walk on the pavement so Dad had to carry him home a few blocks from the petshop. 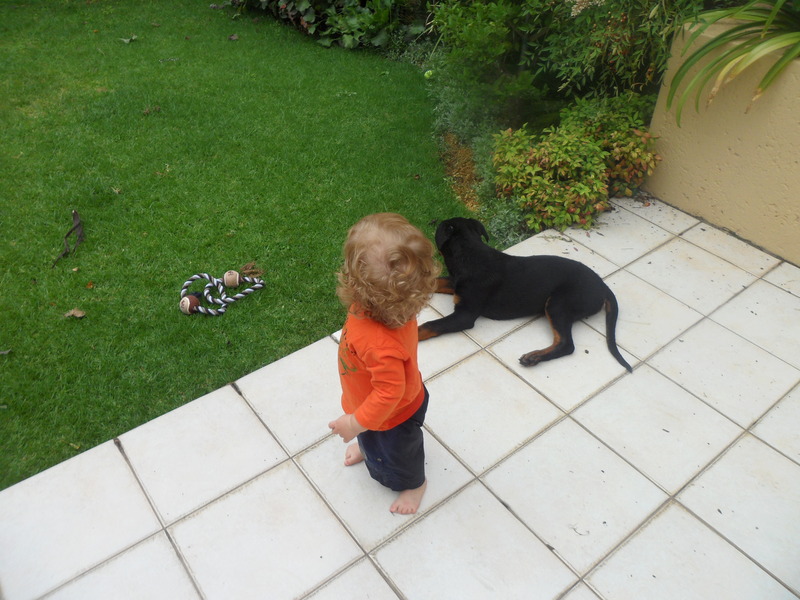 As soon as he arrived home, and after naming him Rex (more Dad’s choice than mine – I wanted to go with Crosby or Leo or Harry, but Rex kinda does suit him), the two of you were bonded as playmates. And yes, he’s overlicked your face a few times and irritated you when he’s accidentally knocked into you, but you love him already. You have a passion for the same toys (balls, fluffy toys and rubber toys), you share your biscuits with him, you both enjoy pulling out dead leaves from the garden, and you both adore playing with his bowl of water. Yesterday, you woke up at 5am for a quick drink, and as you were going back to sleep, you heard the rat-tap-tap of Rex outside, and you wanted to go play with him. So, Rex is trumping sleep for you, little guy. I think he digs you too – he lets you pull his tail a bit, shmoosh him and climb over him, but we are trying to teach you to go easy on him too. Though Rex is pretty big and strong already and is likely to grow to 60kg (which incidentally is my goal weight in my head). From our side, we love that you have a new sibling-like pet, despite my guilt at first that I had to share my love and attention (see, this mom guilt thing NEVER ends). The housetraining is a mission – at almost every turn there is a pile of poop or a puddle of wee, but hopefully Rex will learn his toilet boundaries sooner than later.